Nanostructured Materials for Solar Energy Conversion covers a wide variety of materials and device types from inorganic materials to organic materials. This book deals with basic semiconductor physics, modelling of nanostructured solar cell, nanostructure of conventional solar cells such as silicon, CIS and CdTe, dye-sensitized solar cell, organic solar cell, photosynthetic materials, fullerene, extremely thin absorber (ETA) solar cell, quantum structured solar cell, intermediate band solar cell, carbon nanotube, etc. including basic principle and the latest results. There are many books written on conventional p-n junction solar cells, but few books focus on new concepts in this area. This book is suitable as a guide for researchers, engineers, graduate/undergraduate students who have an interest in next generation photovoltaic solar cells using nanostructured materials. Part I. 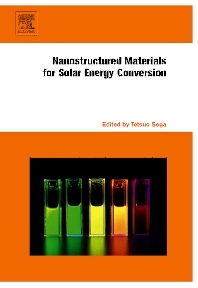 Fundamental of Nanostructured Solar Cells Chapter 1. Fundamental of Solar Cell (Tetsuo Soga). Chapter 2. Device Modelling of Nano-Structured Solar Cells (M. Burgelman et al.). Chapter 3. Optical and Electrical Modeling of Nanocrystalline Solar Cells (Akira Usami). Chapter 4. Mathematical Modelling of the Refractive Index and Reflectivity of the Quantum Well Solar Cell (F.K. Rault). Part II. Nanostructures in Conventional Thin Film Solar Cells Chapter 5. Amorphous (Protocrystalline) and Microcrystalline Thin Film Silicon Solar Cells (R.E.I. Schropp). Chapter 6. Thin Film Solar Cells Based on Nanostructured CdS, CIS, CdTe and Cu2S (V.P. Singh et al.). Part III. Dye-Sensitized Solar Cells Chapter 7. TiO2-Based Dye-Sensitized Solar Cell (Shogo Mori, Shozo Yanagida). Chapter 8. Dye-Sensitized Nanostructured ZnO Electrodes for Solar Cell Applications (G. Boschloo et al.). Chapter 9. Solid-State Dye-Sensitized Solar Cell (Akira Fujishima, Xin-Tong Zhang). Part IV. Organic and Carbon Based Solar Cells Chapter 10. Nanostructure and Nanomorphology Engineeering in Polymer Solar Cells (H. Hoppe, Niyazi Serdar Sariciftci). Chapter 11. Nanostructured Organic Bulk Heterojunction Solar Cells (Yoshinori Nishikitani et al.). Chapter 12. The Application of Photosynthetic Materials and Architectures to Solar Cells (J.K. Mapel, Marc Baldo). Chapter 13. Fullerene Thin Films as Photovoltaic Material (E.A. Katz). Part V. Other Nanostructures Chapter 14. Nanostructured ETA-Solar Cells (C. Levy-Clement). Chapter 15. Quantum Structured Solar Cells (A.J. Nozik). Chapter 16. Quantum Well Solar Cells and Quantum Dot Concentrators (K.W.J.Barnham et al.). Chapter 17. Intermediate Band Solar Cells (IBSC) Using Nanotechnology (A. Marti et al.). Chapter 18. Nanostructured Photovoltaic Materials Fabrication and Characterization (R.P. Raffaelle).